Dr Lance Newey is a Consultant working with InsideOut as well as a Senior Lecturer in Entrepreneurship & Innovation at the University of Queensland Business School, Australia. I was half-way through a 5-day training workshop teaching entrepreneurship to parents and small business owners in Colombia when I had a personal and professional watershed. I wondered: Even if these people learn all this and set up businesses, what are we doing all of this for? As a business school academic, I wrestle with this very issue as waves of millennials come through my classroom questioning all the assumptions on which my classical business and economic training are based. They see the dark side of obsessive economic development and vote no to continuing this paradigm. I felt the threat of irrelevance as I realised I was stuck in an outmoded paradigm. I recalled one of the most powerful statements from the 2013 World Economic Forum: “The leaders of today are trained for a world that no longer exists”. This was me. I see it as a solemn responsibility to not just talk about what’s wrong in the world, but to develop solutions. As an educator, I’m in a prime position to help develop a new generation of leaders. Below is part of a model we are developing at the University of Queensland Business (QB) School and testing on the ground in Alaska, India, and Norway. The model is an answer to the question that punched me in the face in 2013: What are we doing all this for? A credible answer is the concept of wellbeing. Our research defines wellbeing as the capacity of an entity (an individual, a community, an organization, a society, the globe) to resiliently flourish. 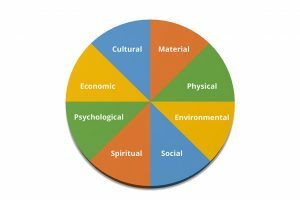 We are interested in how eight components of wellbeing interact: economic, environmental, social, cultural, psychological, spiritual, material, and physical. We focus on these eight because each balance the other to form an integrated whole, creating a powerful framework to guide individuals, businesses, and nations. Problems arise when we fail to see how these eight components work together. In the past, we’ve trained leaders to specialize in just one or two components. If you faced a complex issue, you assembled a multidisciplinary team and hoped some eclectic result would emerge. But this approach, I argue, is at the heart of why we aren’t moving forward. To prepare leaders, we need to look at the interaction between these components. We need to look at polarities. In his book Polarity Management: Identifying and Managing Unsolvable Problems, author Barry Johnson draws a critical distinction between problems to be solved and polarities to be leveraged. Some issues aren’t problems to be solved, he argues. Instead, their fundamental nature is a polarity – an interdependent pair – and the trick is to leverage both sides of the polarity instead of choosing one or the other. Polarity leveraging is supported by both/and thinking, not the either/or thinking we are used to. 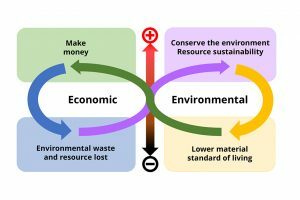 Applying this to our eight-component model of wellbeing, Figure 1 illustrates four fundamental polarities as diagonals: economic and environmental, social and cultural, physical and psychological, and material and spiritual. Social wellbeing, for example, refers to how a society lives together despite differences. Cultural wellbeing refers to our ethnic differences and cultural diversity. These two components of wellbeing are a polarity – that is, they are interdependent for wellbeing. Cultural wellbeing helps to ensure we preserve cultural differences. But if we all retreat into our cultural corners, we lose the integration our modern multi-cultural society needs. It’s not an either/or choice or a problem to be solved. Rather, it’s an unsolvable polarity; both need to be leveraged because they are interdependent to wellbeing. Either/or thinking is costing us dearly in terms of wellbeing. The polarity map in Figure 2 depicts the positive and negative sides of two poles within a polarity. The benefits of each pole are at the top. For example, a key benefit of focusing on environmental wellbeing is resource sustainability – we use more renewables and reduce waste. The bottom boxes are the downsides that occur when we over-focus on that pole to the neglect of the other. We take this cycle of shifting from one pole to another as the norm. We put the economy first and attend to the environment when convenient. Or, we base our whole life on the accumulation of material things and wonder why we feel spiritually empty (material and spiritual polarity). Sometimes we marvel at how elite athletes are in prime physical condition but experience periods of psychological ill-health post-career (physical and psychological polarity). Because we fail to perceive these wellbeing polarities, we get caught in a vicious cycle of “over-invest – create problems – compensate – back-to-where-we-started” loop. When this is played out across all of society, we quickly realize how our lack of polarity leveraging is costing us dearly in terms of our wellbeing. Leveraging both poles at the same time avoids the excessive downsides and creates value on both poles. 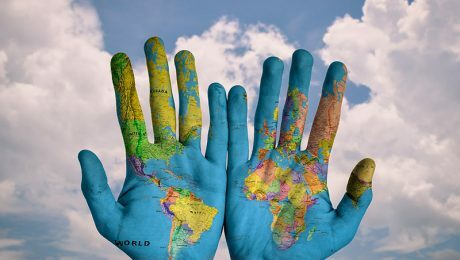 A number of countries are moving to the adoption of a wellbeing governance and performance framework. This is really encouraging news. Many of these frameworks aim to measure the economic, social, environmental, and cultural wellbeing of the country. While this is a step in the right direction, they tend to measure each component of wellbeing separately. If wellbeing is more about how we leverage polarities between components, this is also what we need to measure. At the University of Queensland Business School, we are working on a tool that will help both measure and improve how well countries are leveraging wellbeing polarities. Such a measure will inform countries as to whether they are maximizing wellbeing polarities as well as pinpoint when excessive costs are developing because of inadequate polarity leveraging. It’s about developing a competency for leveraging polarities, not just individual components. We are currently stuck in a paradigm which keeps us unconscious to the polarity nature of the components of wellbeing. To remain in either/or thinking and not shift to recognizing and leveraging polarities is to train leaders “for a world that no longer exists”. Millennials have demanded attention to all eight components of wellbeing for me to hold their attention as an audience. It’s not that either/or thinking must go, but to transition to a wellbeing paradigm we need to increase our both/and thinking. We are currently testing these ideas through rigorous research in Anchorage, Alaska. We believe these efforts will yield a new paradigm for a better world and offer a more satisfactory answer to that vexing endgame question: What are we doing all this for? This article originally appeared in the April – June 2018 edition of ‘Strive’ online magazine. InsideOut Consulting Group’s mission is to provide unique high-quality learning and leadership development services to organisations and individuals across the globe. We are committed to facilitating and supporting individuals, groups, and organisations who want to transform in order to embrace, develop, and fulfil their inherent positive potential and capacity. © 2018 Content by InsideOut Consulting Group. © 2018 Website by BrainVox.